A sampling of 3rd and 5th grade Chukker Creek artists have their work on display at the Aiken Center for the Arts through the month of April. 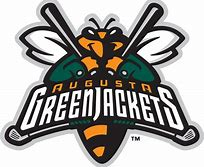 The Augusta Green Jackets program has come to a close. We are super proud of our 144 students who met the reading requirements. The game will be held on Wednesday, May 1st at 7:05 at the new SRP park. Students who completed the program are receiving a free game voucher. Congratulations readers! Our Spring Book Fair has arrived! April 22-26th. It's the perfect time to purchase books for summer reading. We are currently looking for volunteers. 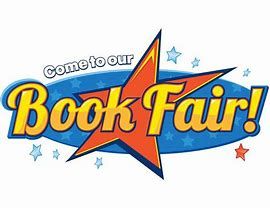 Contact our Book Fair Chairperson, Amy Oldenburg at 703-674-8843 if you can help. We appreciate any time that you can donate. 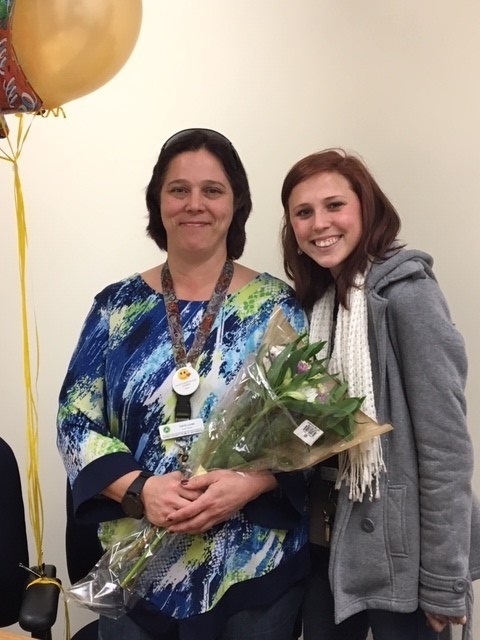 Congratulations to our 2019-2020 GEM Award Winner, Mrs. Susan Hilderbrand. GEM stands for "Giving Even More". Mrs. Hilderbrand is an administrative secretary at Chukker Creek. She is pictured here with her husband and son. 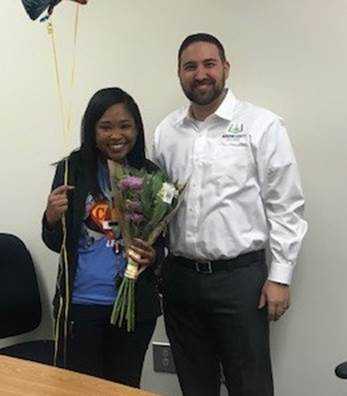 Congratulations to our 2019-2020 First Year Teacher of the Year, Ms. Brianna McCain. 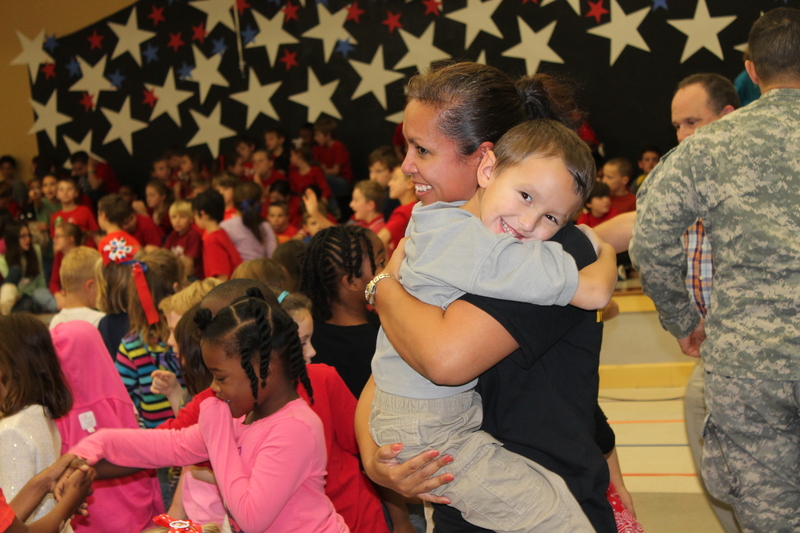 Ms. McCain is a third grade teacher at Chukker Creek. She is pictured here with our Assistant Principal, Mr. Abbott. 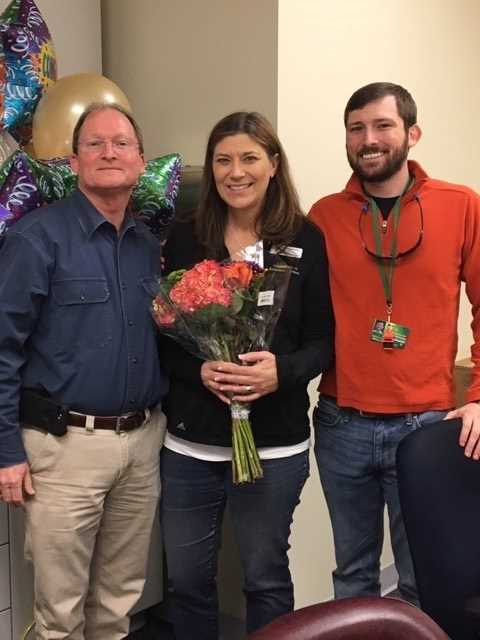 Congratulations to our 2019-2020 Teacher of the Year, Mrs. Carrie Lucas. Mrs. Lucas is a Special Education teacher at Chukker Creek. She is pictured here with her daughter. The Father Daughter Dance will be held on Friday, February 8th from 6:00-8:00. There will be refreshments, dancing, crafts, a professional photographer, and all things sweet! Dressing up is encouraged. This dance is for Chukker Creek students only. Tickets are $15 for a "Father" Daughter pair. Payment is due to the PTO box outside the office by February 1st. You must have a ticket to attend the event. Come have fun with us! Our canned food drive to support the hungry through the Golden Harvest Food Bank was a great success. CCE collected 1,525 cans! The overall school winner was Ms. Palmer's third grade class who collected 212 cans. A big thank you to all who donated! Miss Teen SC Visits the Creek! 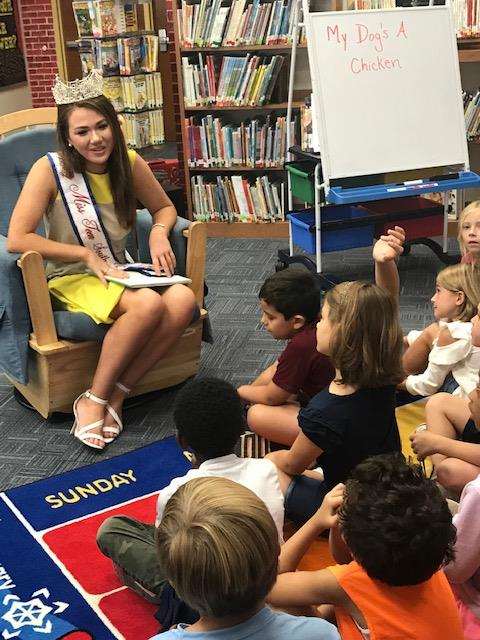 Miss Teen SC, Grayson Brackett, visited Chukker Creek on Friday, October 6th. She read to classes and visited with the students. We are happy to report that Grayson is a former Chukker Creek student. We wish her much luck as she competes in future pageants. Mayor Rick Osbon visited with CCE first graders on Tuesday, October 2nd. Our first graders have been learning about our government beginning with our local level government. 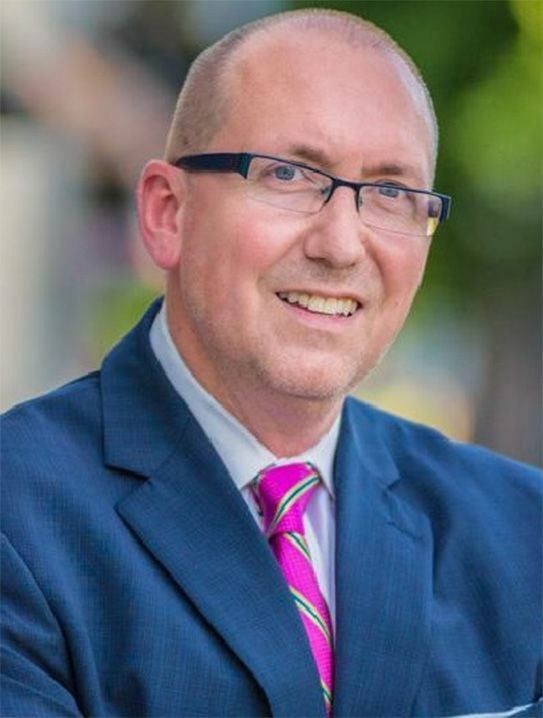 We very much enjoyed our visit with Mayor Osbon. DAY OF CARING SUCCESS: Many thanks to all who came to our Day of Caring. 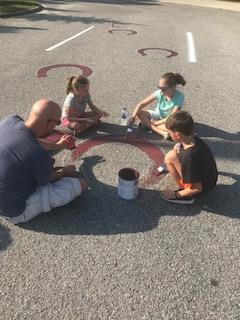 We made improvements to our front parking lot by repainting the lines and adding horseshoes. We truly appreciate the time, effort, and energy displayed by all who came. We Need YOU! Become a Watch Dog! Calling ALL Dads...We need YOU! Please consider volunteering at our school. 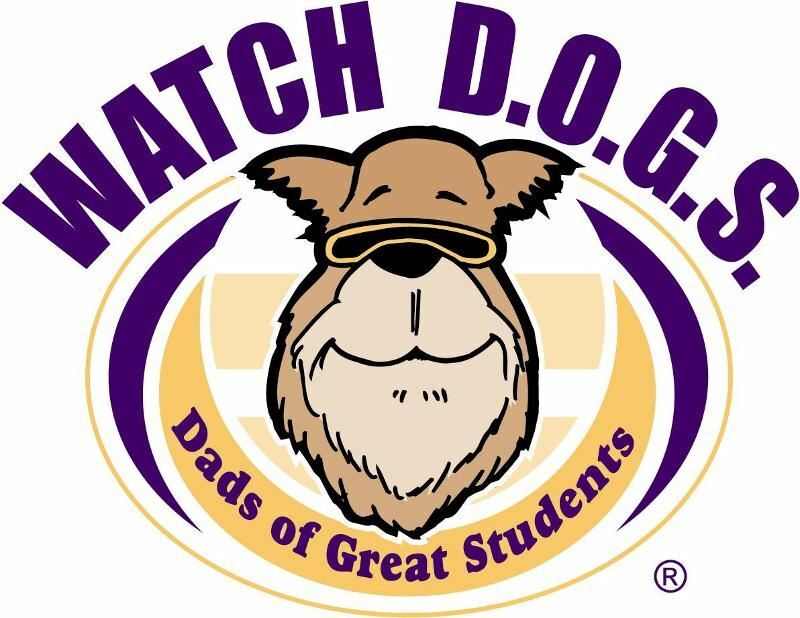 Become a Watch Dog! Wow! What awesome grandparents we have! 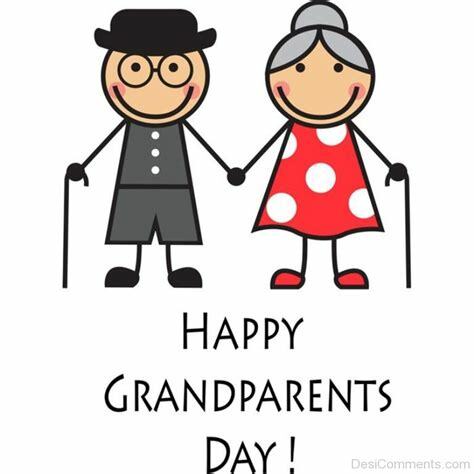 Thank you to all of our grandparents who attended Grandparents Day at the Creek. Please stop by and see us throughout the year. We welcome you! 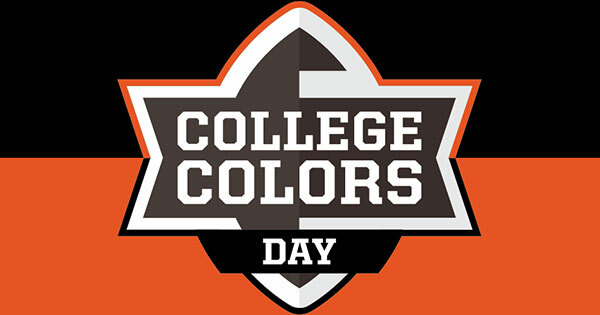 On Friday, August 31st, CCE students particiapted in College Colors Day by wearing their favorite college team shirts! Get a jump start on "Back to School" shopping. 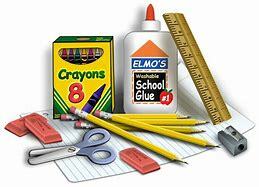 Find your school supply lists here.